The author, Matthew Shaer, takes an in depth look at the debate which might as well be titled: “is New York City ready for bike lanes?” as if this is the only monitor of whether people can actually ride a bicycle in New York City. But still it’s hard to ignore the heated discussions and the platforms for everyone to vent their hatred of cyclists which really is about: “food delivery people riding on the sidewalk and this not being regulated.” oh yeah, “and the NYPD’s hatred of cyclists dating back to the days of critical mass and the Republican National Convention.” But let’s just forget history for a moment. Let’s all pretend the popularity of cycling just magically began because King Bloomy hired Janette Sadik-Kahn in the DOT and then painted some of the asphalt green. Of course this pissed off the car loving neighbors, especially when it interfered with their ability to park and speed. 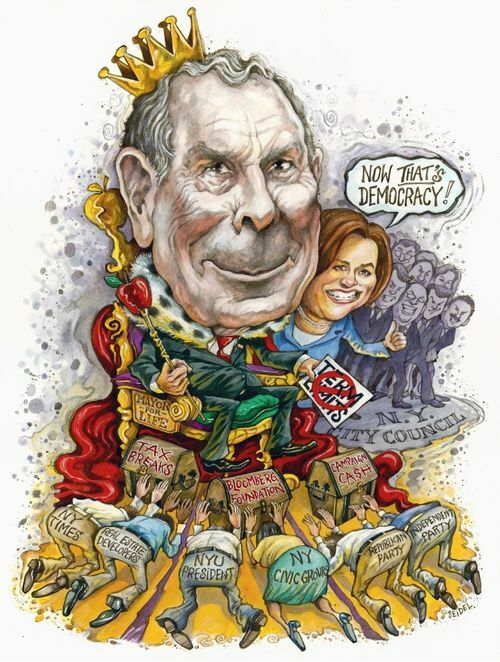 So enjoy NY Magazine and their love affair with two stone age minded cranks. One is Â­Louise Hainline, dean at Brooklyn College, founder of the quite Orwellian sounding group: Neighbors for Better Bike Lanes or NBBL, kind of like the war department entitled, ministry of love. it’s great to know that someone can sit in their ivory tower, on the Prospect Park West and so easy effect the discussions about safety and bicycle infrastructure with the stroke of their pen…oh yeah and it helps to have powerful politicians on board who happen to live on Prospect Park West like Senator Chuck Schumer and his wife, former do-nothing DOT commish Iris Weinshall. Wow, I really hope they are not inconvenienced from getting their groceries form the illegally parking fresh direct trucks. n a blustery day this winter, Â­Louise Hainline, a dean at Brooklyn College, stood on the roof deck of her Park Slope building, Â­ankle-deep in fresh snow, squinting intently into the sun. Below, a lone cyclist coasted southwest along the iced edge of Prospect Park. Hainline shook her head. â€œAnd they say this bike lane gets a lot of traffic,â€ she scoffed. Here is a nice follow up by bicycle blogger: Brooklyn Spoke. 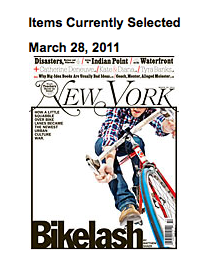 Hey in that wonderful New York Magazine image the car is in the bike lane!